It became common knowledge in Triumph circles in 1999/2000 that for the right money The Macau was available yet again. 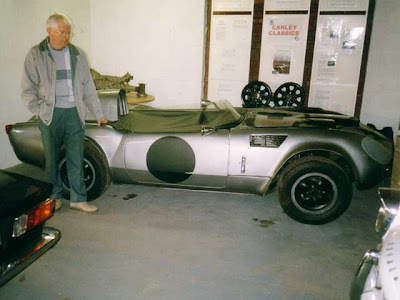 In 2001 we made our first tentative enquiry, checking the cars provenance and the price! On the 4th July 2001 we rented a Mercedes Sprinter and drove to Switzerland to buy The Macau. On arrival our initial impressions were disappointing, parked in an underground garage blocked in by several other dead cars, under a layer of dust The Macau sat forlornly on 4 flat tyres. After much pushing and shoving we managed to get the car out into the daylight where Dieter tried to get the engine started on petrol that smelt ancient. After several failed attempts pools of foul smelling petrol were forming on the floor under the open ram pipes of the 45 DCOE Webbers, this promptly caught fire! This was quickly put out and further attempts at starting the car were quickly forgotten about. Despite this I was more than satisfied that this was indeed The Macau before me, and I was happy to see the excellent condition of the basic car and the many original 1965 features still in situ. Back home in Coventry we quickly gave the car a good wash, polish, and servicing after its period of inactivity. Temptation got the better of me and I steered The Macau out of Canley Classics gate straight on to Triumphs old test route mentioned by Fred Nicklin above, and cobwebs were duly dispensed with (in both me and the car!). 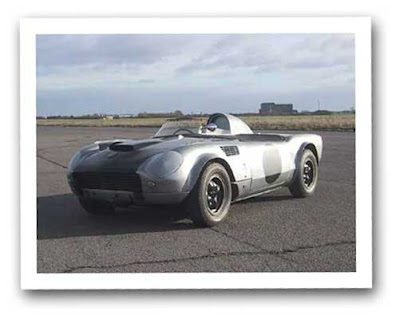 Since then The Macau has been regularly exercised including re-visiting the Mira test track with Fred Nicklin driving ( Classic Car Magazine article reproduced here), a blat around Enstone Airfield ( Practical Classics Magazine article reproduced here), and being displayed at the NEC Classic Car show and the Triumph Show at Stoneleigh. David Lloyd paying us a visit to inspect his handywork. David worked at the Triumph and actually drew up the Macau's special features. He was also responsible for the manufacture of the Macau's fibre glass panelwork including the rear deck, and hump. David has promised to help us reinstate a more sympathetic (to the original) hump.